Lena Pettersson is to become the new LiU director of higher education when Lars Rydberg retires. She has a long, wide experience of both undergraduate and research education, most recently with the Swedish Higher Education Authority. When Lena Pettersson takes over as director of higher education on 24 August she can also be said to be coming back to LiU. Since then Lena Pettersson has been very busy. She was part of a group of researchers who set up the Swedish National Institute for Working Life. “The focus was work and culture, work and gender, work and ethnicity. We built it up from scratch. I also worked as deputy head of one of the National Institute for Working Life’s units - Labour market and integration - and as head of administration for the whole of the Norrköping unit. At that time Lena Pettersson was also representative of the Institute for Working Life in the development of Campus Norrköping and was general public representative on the board of the Faculty of Art and Sciences. That led Lena Pettersson on to the Swedish Defence University where she worked on research and education and then on to the Swedish Higher Education Authority, where she has been working since 2012 on higher education quality assurance. Most recently on the development of a new quality assurance system at the research level. 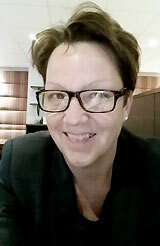 So it is with a hatful of experience and with the idea that quality is important that Lena Pettersson returns to LiU. Right now Lena Pettersson is sitting and playing with three pages of A4 filled with her forthcoming areas of responsibility, something she intends to spend part of the summer getting stuck into. A total of 21 people applied for the post of director of higher education, half internal applications, half external. According to the University Director Kent Waltersson it was a gratifying recruitment process since there were many, very qualified applicants. In the end it went to Lena Pettersson. “I’m very happy to be able to welcome Lena to LiU as director of higher education. Lena is very knowledgeable about universities, is well established in quality issues and demonstrates a broad knowledge of society. In Lena we are getting a smart, tenacious, collaborative character in the role of director of higher education,” says Kent Waltersson.